(CNN) – Sen. Rand Paul cut another six-figure check to the United States Treasury Wednesday, taking the money he said he didn't need from his office's budget to make a tiny dent in the nation's massive federal debt. "We watch every purchase," Paul, a Republican from Kentucky, said at an event next to an oversized check for $600,000. "We watch what computers we buy, what paper we buy, the ink cartridges. We treat the money like it's our money, or your money, and we look at every expenditure." The $600,000 reflects more than 20% of Paul's annual office budget, according to a press release. Another GOP lawmaker, Rep. Mick Mulvaney of South Carolina, said he would return $160,000 to the federal government, or 12% of his office budget. Last year Paul returned $500,000 to the Treasury, and said he hoped other members of Congress would follow his cost-cutting lead. In total, Paul's office says they've returned $1.1 million that was unspent from his office's operating budget. Last week Paul delivered a tea party-sponsored response to President Barack Obama's State of the Union address. He also said on Sunday that he would decide next year on whether he'll run for president in 2016. Paul, who was elected to the Senate in 2010 with strong tea party support, has already taken steps that signal a presidential bid may be in the cards. He visited Israel in January, agreed to speak at the high-profile Conservative Political Action Conference next month, and even took shots at another potential Republican White House hopeful, Gov. Chris Christie. Paul's father, former Rep. Ron Paul of Texas, ran three times for the White House. Good for him. An admirable model that all who work in government should emulate. Now, if he could get his fellow TP members to stop flying off to Israel on the taxpayer dime to effect foreign policy, or actually pass real jobs bills, or halt the Sequester, that would be a much more significant contribution to America. That may just be too "big picture" for a man named after a bad Russian novelist however. Like father, like son. The Pauls' extremely made-over version of libertarianism gives the ideolog a bad name. Anyone who believes that being a bigot is freedom of speech should not be a part of our government. Unfortunately, our democracy allows for the participation of extremists. Its KY who is going to notice less money for anyone worthwhile. The south is their own worst enemy! I am surprised the fake doctor didn't keep some money to pay for a real education. That's Not Impressive At All, Kentucky Takes In Boat Loads of Federal Dollars Each Year From The Federal Government. Via [Reuters] The budget posted a surprise surplus in January for the first time in five years, as the Treasury likely benefited from a windfall when payroll tax cuts expired. The budget registered a $3 billion surplus, the first time there had been a surplus in January since 2008, Treasury Department data showed on Tuesday. Economists had been looking for a $2 billion gap. The surplus compared with a $27 billion deficit in January 2012. How frigging refresing!! Someone that acutally cares about our tax dollars. Now the flip side, Jackson Jr. NOLA former mayor Nagin both of whom were under investigation & yet voted back into office. Then squander money where/when possilbe. Not to mention Obama taking our taxpayer money to give to his donors and under the gise of "green energy investments". If we had more Rand Paul in office we would not be in any of this mess we have in the economy. But America u voted for these fools, so you get the govt you ask for. Very noble, Rand. However, what you are really trying to buy with that check is political advantage. If you're such a Libertarian, then you should be paying for your own healthcare, and you should refuse your Senate pension when the time comes. Good for him, would love for all Senators to do this. Not that it would have any significant effect on the debt, but still glad to see someone is watching out for the American taxpayer. Still probably voting libertarian again in the next election even if it is Rand as the nominee though. 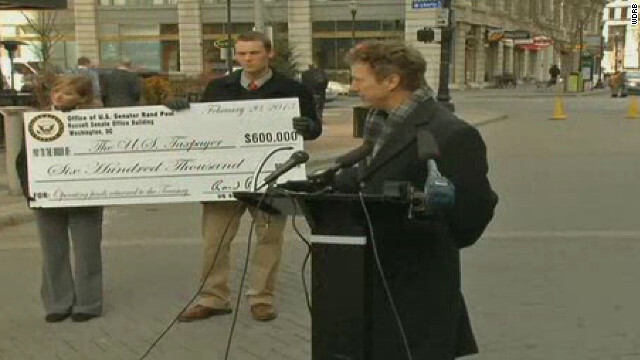 I applaud Rand Paul's initiative to cut costs from his own budget. But why stop there? Apparently, his office had be given a budget of 3 million. Which prompts the question of what his office spend the remaining 2.4 million on? Since Rep. Paul simply votes 'no' on every democratic or bipartisan bill, filibusters a CIA director nomination critical for national security and is an obstructionist whenever and wherever he can be, I wonder what he needs the remaining $ 2.4 million for? Trust me, lots of people could say no to everything for far less money. Randy, write another check over 2.4. million, would you please. Thanks, the people. This guy is legit... we need more guys like Rand Paul and Ted Cruz. As much as I dislike Paul (and I think dislike isn't a strong enough word), I do commend him for cutting waste where he can and wish others in Congress would do the same. It is rather ironic he's giving back money to the treasury as part of waste cutting efforts ... by using a giant check that's just for show haha! He wants to be president so bad . Aqua Buddha , a True Patriot . The 2016 Republican primary is going to be expensive and incredibly amusing to watch. I see he's solved all of the problems in Kentucky and has no need for funds to help with his goals in his home state. The Paul family offers America another person with over-simplified solutions to complex problems. His ideas make good sound-bites for the fearful, white, bigoted, and isolationist Tea Party who want to reduce our federal government to a dysfunctional level. Yet his ideas would leave America weak, backwards, and diminished as a world power. Bless you for your conservative honesty. Obama bloated the federal government, unnecessarily, and now cuts to that bloating, are not only needed, they are essential. Where? In what areas? Increased spending on food stamps, welfare, and unemployment, due to the Republican Recession? The peewee Herman lookalike teaparty loser Ted Cruz and Paul will be thrown out like the trash they are in their next election !!!! Ryan has pushed for earmarks around the same time he started complaining about the practice. He also lobbied for stimulus money while objecting to President Obama’s spending bill. And in at least two instances involving the Department of Transportation, Ryan has pushed the interests of companies whose members have given him campaign donations, according to records obtained by The Huffington Post. Steering transportation funds, or weighing in on regulations, is one of the most direct ways a congressman can exert influence. Ryan is certainly not the only politician to attempt to influence the DOT over its decision making. But the fact that Ryan was willing to go to bat on behalf of campaign donors drives against the narrative Ryan has long claimed — that he is a special kind of politician, more saint than sinner. Look, the problem with libertarians, the Paul family, tea party, conservatives and the republican party as a whole isn't the "stated" ideology. It's the follow thru. Cut, cut, cut is all they have been screaming. This is actually doing as you say. Drop in the bucket and we could do without the symbolism. But well received. I'll say this much for most libertarians. They at least try to stick to their morals. Unlike conservatives that will alter their own religious beliefs for politics. The money most likely came from surplus expense money. Only gullible ideologues would believe that he saved half a million dollars by purchasing *fewer* comoputers, paper, and ink cartidges in just a single year.